Where is Activity Manger Options located? Show calendar screen first in activity viewer: If this option is checked, the Activity Manager will open into the calendar view. If this option is not checked, the Activity Manager will open into the Activity List view. Open activity calendar with 15-minute increments: If this is checked, the Activity Manager will open with 15 minutes intervals, otherwise it will use 30 minutes intervals. Mark Future and Past Activities on Side Calendars. If this option is selected, any dates that have future or past activities scheduled will appear bold on the side calendars. If this option is not selected, dates that have activities scheduled will not appear bold on the side calendars. Show 7 Day View in Columns. If this option is selected, 7 days will show in a column on the calendar. If this option is not selected, only one day will show at a time when the calendar is viewed. Require activity results. If this option is selected, results will be required for all activities. If this option is not selected, no results will be required. Show Completed Activities on Calendar by Default. If this option is selected, all completed activities will be shown on the calendar by default. If this option is not selected, you will have to manually choose which completed activities will appear on the calendar. Show Completed Activities on Activity List by Default. If this option is selected, all completed activities will be shown on the activity list by default. If this option is not selected, you will have to manually choose which completed activities will appear on the activity list. Show To Do list on Calendar. If this option is selected, the To Do list will appear on the calendar. If this option is not selected, the To Do list will not show on the calendar. Create Work Assignment by Default when Double-clicking on Calendar. When this option is selected, a work assignment will be created when you double click on the calendar by default. If this option is not selected, you will have to click on the calendar and click Create Work Assignment to create a work assignment. Show Complete Button on New Activities. If this option is selected, the complete button will be shown on all new activities. If this option is not selected, the complete button will not be shown. Show Balance Due on Calendar if possible. 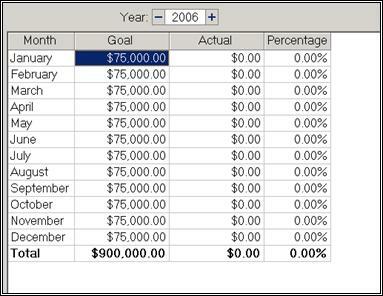 If this option is selected, a company's balance due will be shown on the calendar. If this option is not selected, the balance due will not be shown on their activity. Enable Reminders. If this option is selected, reminders will be enabled. If this option is not selected, you will be unable to use the reminders. By Default set reminders to: .If this option is selected, you will be able to set reminders to appear at certain times by default. Check for reminder every minutes.This option allows you to set a time interval that your system will check for reminders. For example, if you selected 6 in the scroll down box, your system would check for reminders every 6 minutes. Track billing time. 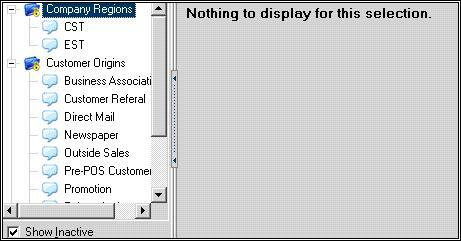 If this option is selected, the billing time will be tracked. If this option is not selected, the billing time will not be tracked. Calls, meetings, appts billed as actual. If this option is selected, all calls, meetings, and appointments will be billed as actual time. Calls, meetings, appts not billed. If this option is selected, all calls, meetings, and appointments will not be billed. Select Activity Types to Show by Default. This option allows you to select which activity types will be shown by default in control. Only the options you select will be shown by default. Reset Values Button: If this button is clicked, it will reset all your current selections to your default selections. These are currently used to define the color of an employees Calendar. Additional functionality may be implemented for this feature in future releases of Control. This screen allows you to determine calendar statuses. Active - When this option is selected, the calendar status is active. If this option is not selected, the calendar status is not active. Description: [ text entry ] - You can enter a description for the calendar status here. Colors: Change color when status is selected. - When this option is selected, the color will change when the associated calendar status is selected. If this option is not selected, the color will not change. 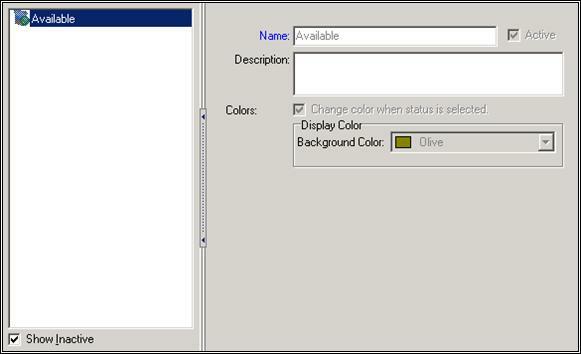 Display Color - Background Color: -This option allows you to choose the background color that will be displayed. Show Inactive - When this option is selected, all calendar statuses will appear in the list. If this option is not selected, only active statuses will appear in the list. With that Employee selected, click on the “Action” menu that is located at the very top of Control > Select “Status” > Choose the status you would like this Employees calendar to use. 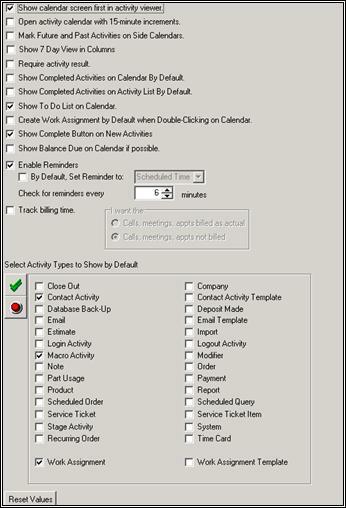 Once set, you may open up the Activity Manager > Enable the calendar for that employee > And you will notice that the background color for the entire calendar is the same as what was selected in the Calendar Statuses setup area. Salespersons can use this box to create sales goals for themselves. All they have to do is select a year and click Add to enter new goals. This section covers the different selection list items used in Activity Manager. Appointment Type - This can hold a list of possible appointment types to choose from when the activity type is Appt. Call Type - This can hold a list of possible call types to choose from when the activity type is Call. To Do Type - This can hold a list of possible to-do types to choose from when the activity type is To Do. Meeting Type - This can hold a list of possible meeting types to choose from when the activity type is Meeting. Other Type - This can hold a list possible other activity types to choose from when the activity type is Other. Location - This can hold a list of possible locations to choose from when setting an activity. Description - This can hold a list of possible descriptions to choose from when setting an activity. Roles - This can hold a list of possible roles to choose from when setting an activity. This shows any marketing lists setup for use by your company, and allows you to edit or add to the list. This option allows you to set Marketing List Codes for Industries. You are able to set two codes, as shown in the picture.